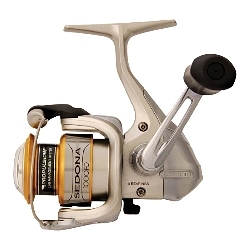 Enjoy a smooth, strong and reliable Shimano Sedona FD Spinning Reel for an affordable price! Shimano redesigned their Sedona FD Spinning Reels to incorporate top-of-the-line, performance-enhancing features such as their Propulsion Line Management System and the Power Roller III to give anglers the reel confidence required to meet any challenge. The Sedona FD Spinning Reel's lightweight graphite frame, sideplate and rotor provide tremendous strength and durability, with the Sedona FD's cold forged aluminum spool works in tandem with the Propulsion Line Management System's new spool lip design to deliver increased casting distance by minimizing friction and preventing backlashes. "For the price you really can't beat this reel. I've used my 1500 series for two years now for pan fish, walleye, and mostly bass. After two years of hard fishing the bail sometimes wont close shut on the cast but I have drop it in the sand a few times." "This is an amazing reel! I absolutely love it! It has the finesse to fish for RAINBOW TROUT but still has the power to turn a drag busting BULL RED! Trust me I've owned Van Staal, Penn, Abu Garcia, Okuma, Quantum, Fin-Nor, and Diawa but this reel is by far the most versitile and efficient." "This is a great reel. The drag is very reliable. I have caught a 6.5 pound largemouth with this reel and it held up very nicely." "This reel peforms so well. It has a smooth action, and it also cast well."